The Impact Sport electronic earmuff by Honeywell is an amplification device that amplifies (up to 4X) any sound under 82 decibels and blocks anything louder. The Impact Sport electronic earmuff is commonly used at gun ranges so people can protect their hearing from gunshots while still being able to hear range commands. Its low profile fit is very comfortable and its housing even has an AUX jack for listening to your favorite music during down time. Although it is a popular item at the gun range, it is also an excellent product for use in the field while bowhunting. Using this product is very simple. Simply insert the batteries, and turn on. The adjustable volume and the on/off switch are one in the same so simply spin the dial to adjust or reverse the spin until it “clicks” off. There is an audio jack that can be used with a male to male headphone cable. Once an MP3 player is plugged in, you can hear it in the earmuffs; nice feature! My first experience with the Impact Sport electronic earmuff was amazing. With the volume cranked up, every time I made a keyboard stroke on my computer, it sounded like someone was slamming 2x4s against the floor in a hallway. The Impact Sport earmuff also made my dog’s breathing sound like Godzilla was breathing down my neck. I was impressed, but how would they perform in the field? 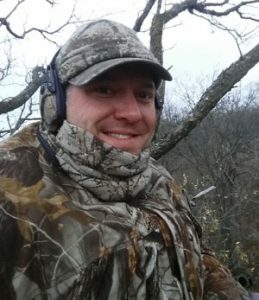 I initially wore the Impact Sports in my favorite permanent treestand. They brought a quiet woods to life in a loud way and definitely made me aware of every creature’s every move. The effectiveness of this product made me a little jumpy, but I soon calibrated my response to my new audio environment. After my first experience in the stand with this product, I knew exactly what condition it was best suited for; hunting from the ground or in thick cover. With this in mind, I visited a tripod stand of mine that was located in a dense thicket with only a couple narrow shooting lanes. This was the kind of stand in which a hunter has to have their bow in hand and constantly be on the lookout. During previous hunting experiences in the tripod, I have slept deer or have noticed deer slipping in and out our my shooting lanes too late. Now I had the equalizer. 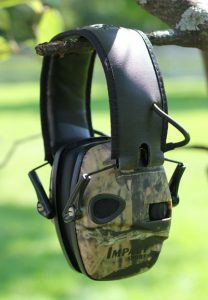 With the Impact Sport electronic earmuffs by Honeywell, I didn’t miss a deer. I heard and watched a doe and a buck quietly bed down 27 yards from me in a thick patch of shrubs. I also heard and watched numerous other deer pass through the surrounding area all morning. The Impact Sport electronic earmuffs were pretty much giving me a 20 yards “heads up” that deer were closing in. This gave me time to spin towards the deer and start glassing. They are the equalizer in thickly vegetated country; a must have for any hunter who hunts this kind of environment. For more information, visit their at http://www.howardleight.com/ear-muffs/impact-sport–2. This is a great product to have in close quarters while bowhunting. The Impact Sport electronic earmuffs really do give you a heads up when game is approaching ultimately increasing your chances of success.